I was lying down in grass on Ditchling Common in Sussex when out of the corner of my eye, I spotted something happening which grabbed my attention. A Spiked Shieldbug, Picromerus bidens was dragging this Pale Tussock Moth caterpillar, Dasychira pudibunda, up a grass stem. 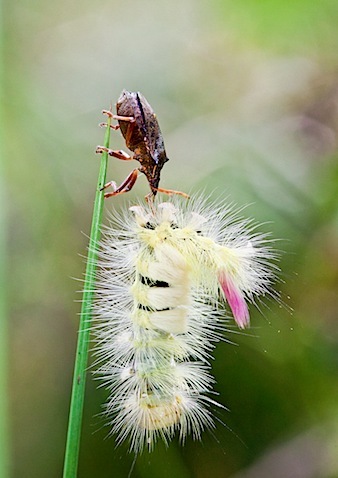 At the time, I had no idea that these shield bugs feed on caterpillars as I’d never previously witnessed anything like this. Presumably, the bug was searching for a safe place in which to devour it’s prey. 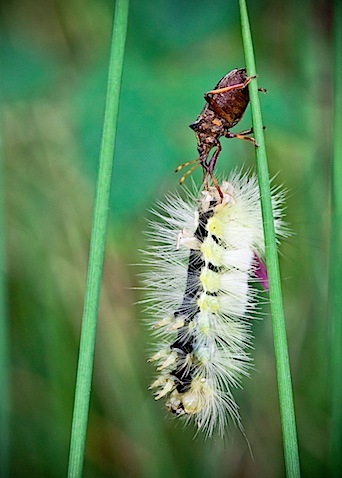 The internet is an excellent resource for identification purposes, I had no idea what sort of caterpillar this was before I looked it up using Google images. I also use it to research the lifestyles of the creatures I’ve discovered. I can’t imagine how I’d manage without it! Canon 5D Mark II, 100mm f2.8 macro lens, 1/200 sec @ f8, ISO 800, fill flash, hand-held. 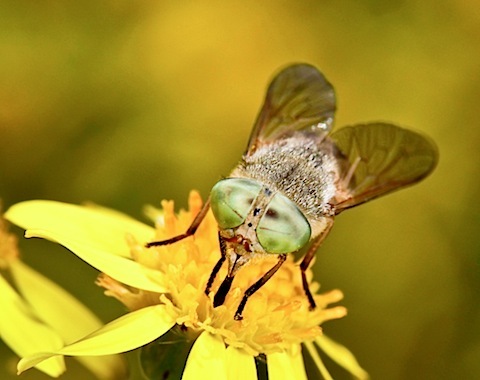 However, I’ve never managed to find out what sort of fly I shot in the following image. 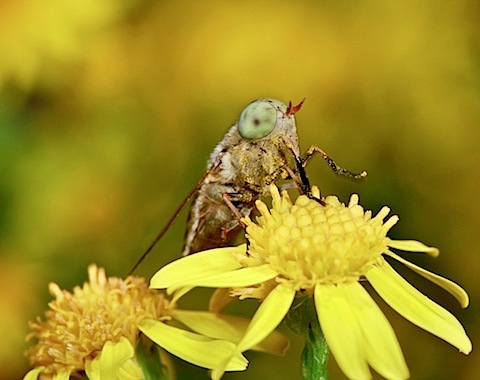 It was the size of a blue bottle but had sage-green eyes and a very pale brown thorax. If anyone recognises it, I’d love to know what it is. Canon 5D Mark II, 100mm f2.8 macro lens, 1/200 sec @ f11, ISO 100, flash, hand-held. You have a steady hand, great photos. What kind of flash do you use? Do you bounce it? Thanks Denise, I use the Canon macro twin flash MT 24EX, with plenty of diffusion, most of the time. I don’t bounce the flash and using the f2.8 lens with the IS, stabiliser function helps with the sharpness. Also a lot of practise!